Regular readers (and those recent .gov visitors) may recall that I’ve been trying — for months — to get Kings Bay sub base to turn down the volume on the perimeter alarm PA system. I really don’t think there’s a non-weaponized reason for the sound pressure level to be so high that the “This is a restricted area..” announcements can wake me up inside my house with closed windows… more than* roughly half a mile from the base perimeter. Obviously, base security disagrees. Or they have weaponized the PA system. It doesn’t help that these alerts blare out every few minutes, 24/7, every time some radicalized Islamic squirrel tries to infiltrate the perimeter, setting off the motion detectors. My complaints to the base weren’t doing any good, so just for the helluvit, I started CCing my Senators and Representative. The base actually turned down the volume when I did that. For a few days. I regret to hear of the situation. 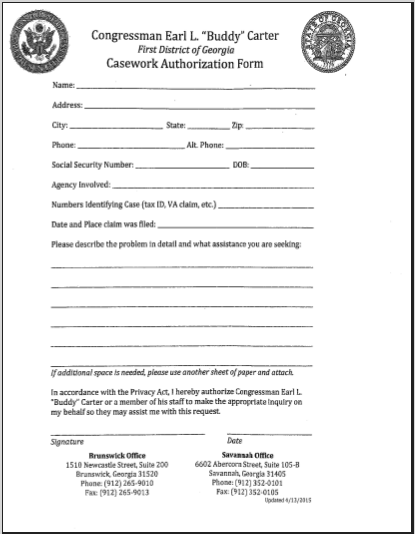 I have attached a Congressman Carter Privacy act form for you to fill-out, sign, and return to our office at your earliest convenience. The attachment was a PDF, demanding that I provide all the information I’ve already given ol’ Buddy’s office, plus my Social Security number and date of birth. My immediate thought was that someone read of my PA problems here and was taking advantage of the situation to try scamming me out of all that info so beloved of ID thieves. Emmitt Nolan is running his own personal ID theft scam out of a congresscritter’s office, taking advantage of constituents largely conditioned to automatically comply with government requests. Oh. And the PA system? They turned the volume up again this morning. * Edited to correct line-of-sight distance. I got the “more than a mile” figure from Google Maps, but it bothered me. I rechecked it against Mapquest and got the lower figure which matched my personal guesstimate. I think the difference is a matter of where Google vs. Mapquest would let me place waypoints.